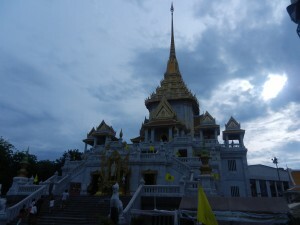 A Thai temple’s forms help you get into its spirit long before you go inside. We’ll examine this spirit in this post, and see some of the depths of one of the world’s most fascinating cultures. The above shot is of the crown of Bangkok’s Wat Traimit, which houses the Golden Buddha. The building that shelters it follows some of the ideas behind Angkor Wat, but with a Thai difference. The main tower of both monuments embodies the mountain at the center of the universe according to Hindu and Buddhist cosmology, Mt Meru. Thais inherited this idea from India and Angkor, but they made magic with it. Angkor Wat is every bit as magical, but in a different way. It too rises to the heavens, but it also has a worldly personality. Its massive frontage commands the earth. Khmer kings liked to build imposing monuments to beef up their mystiques. Khmer art at its finest balances the testosterone with celestial elegance. Angkor Wat is thus a full view of the universe. But Thais developed talents for lengthening and narrowing art forms. 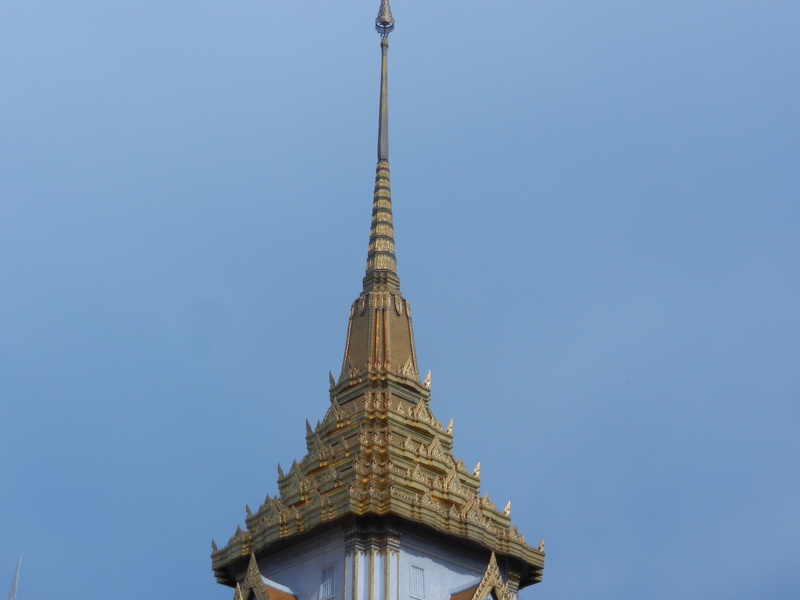 Wat Traimit’s tower curves upwards as delicately as an apsara’s flight. On both Wat Traimit and Angkor Wat, the smaller towers around the central spire symbolize peaks around Mt Meru. 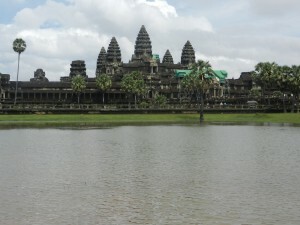 But the Khmer system spreads out and dominates the landscape–it insists on taking over your perspective. But the builders of Wat Traimit made Mt Meru’s forms light and playful. They thus reflect the otherworldly grace of the Sukhothai Buddha’s forms. They radiate the statue’s gentle energies throughout the neighborhood. This use of forms to create lilt rather than bulk makes magic in Thailand. 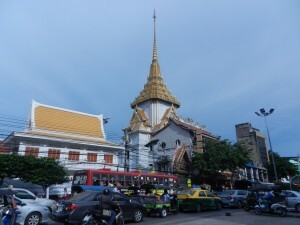 Bangkok’s notorious traffic lived up to its reputation when I was there. 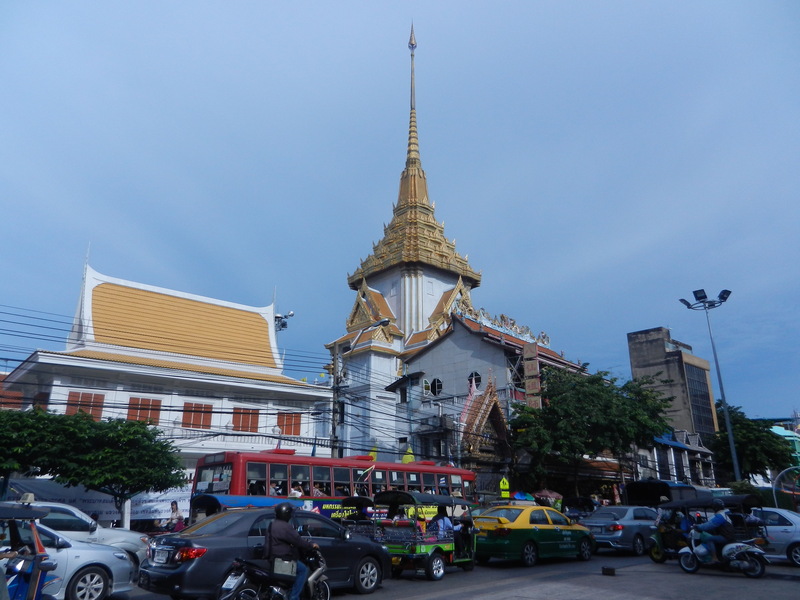 But the city’s bejeweled with many temples, and they open the perspective into these playful landscapes. And because Thai architects and artists used forms that play more than dominate, they were able to create infinite variations. So the more Thai art works you explore, the more magical the landscape becomes. More apsara flights to come!